And 99% of parents think they are correctly fitted! According to Good Egg Safety, on a national level, 6 out of 10 car seats are installed incorrectly! The picture on the left shows the shoulder belt threaded in the path of where the lap belt should go, and the lap belt is going behind the seat through the path of what should be the shoulder belt. The picture on the right shows the car seat forward facing. The baby car seat we buy is a Group 0+ seat. They can only be installed rear facing! There are no “faces both ways” in this group of car seats! 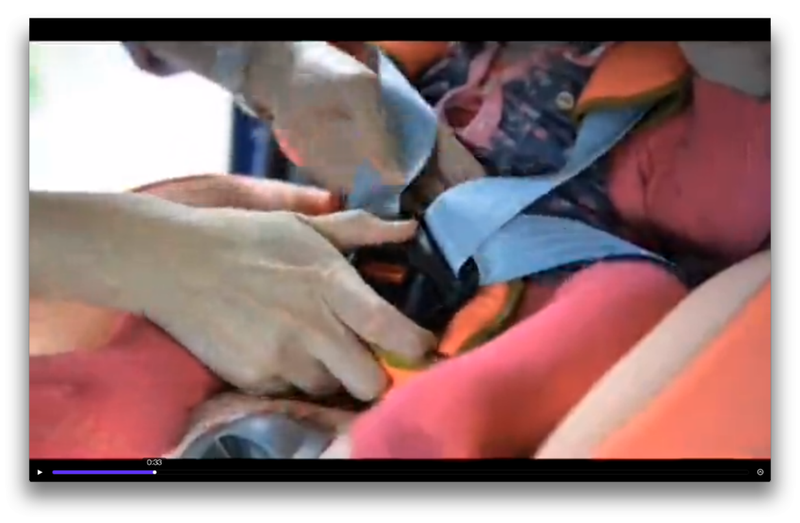 This crash test video shows us what an impact at 64km/h looks like if the car seat is installed incorrectly, like the two photos above. It’s not a pretty sight, is it? Personally, I find it a little hard to watch. 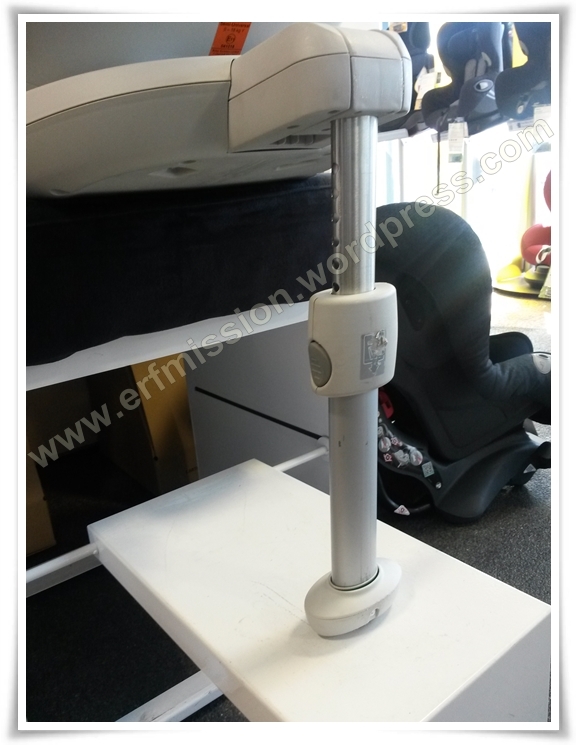 Britax Dualfix installed in ‘forward facing’ mode. Straps are below shoulders. This is wrong. 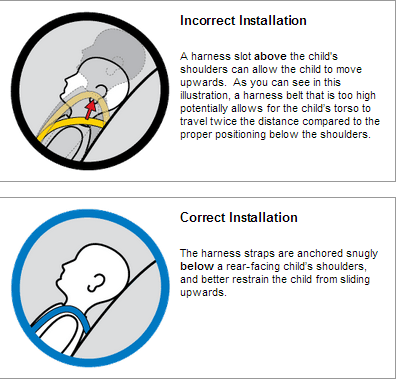 When the car seat is installed in the forward facing position, the correct placement of the harness is at or above the child’s shoulders. Not below, like Henry is demonstrating in this picture. This is very important because when the child is forward facing during a frontal collision, the crash forces will cause the child’s body to be thrown forward. The harness straps should be positioned at or above the child’s shoulders when forward facing to most effectively decrease the amount of distance the child will travel when propelled forward and to limit the forces on the child’s spine and shoulders. Britax Max-Way is a rear facing car seat. 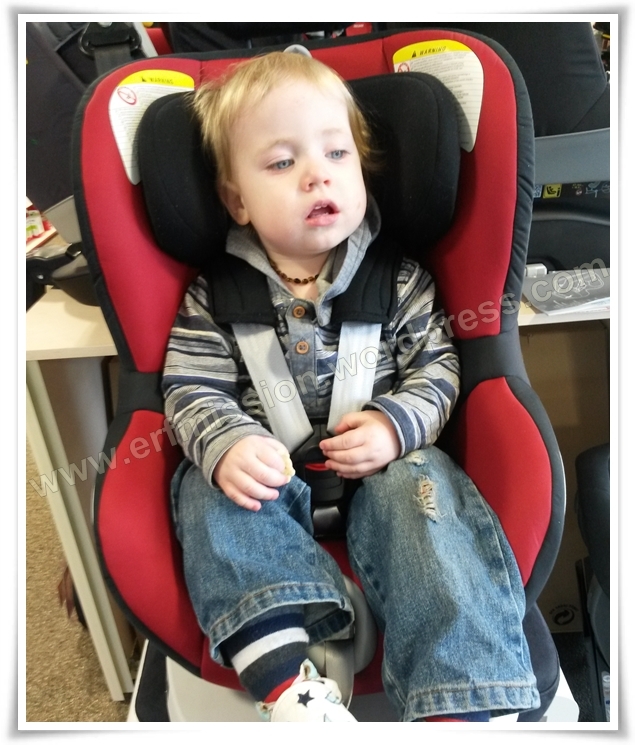 The headrest is pulled to the top, making the straps go far above the child’s shoulders. 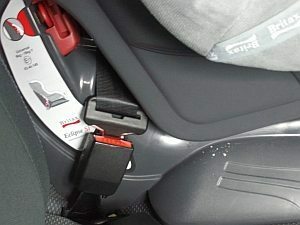 During a frontal crash, the most common type of collision, the crash forces will cause a rear-facing child’s body to ride up the seat shell back. 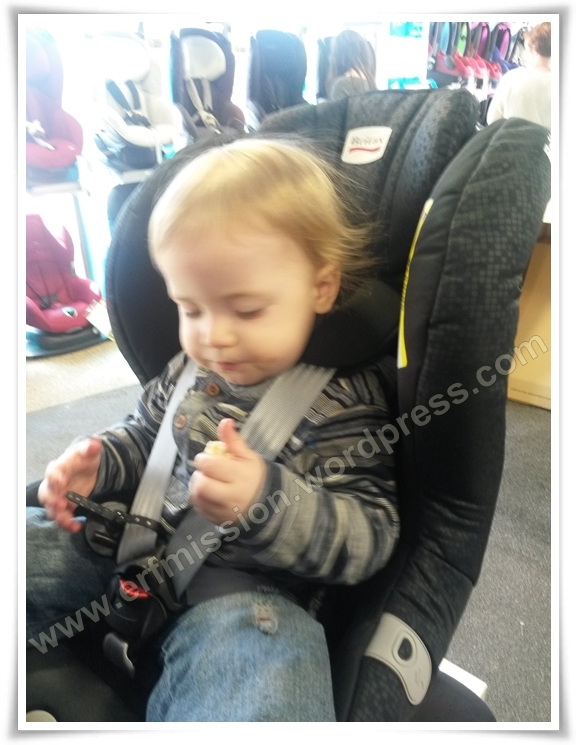 The harness straps should be positioned at or below the child’s shoulders to firmly hold the child down in the car seat. 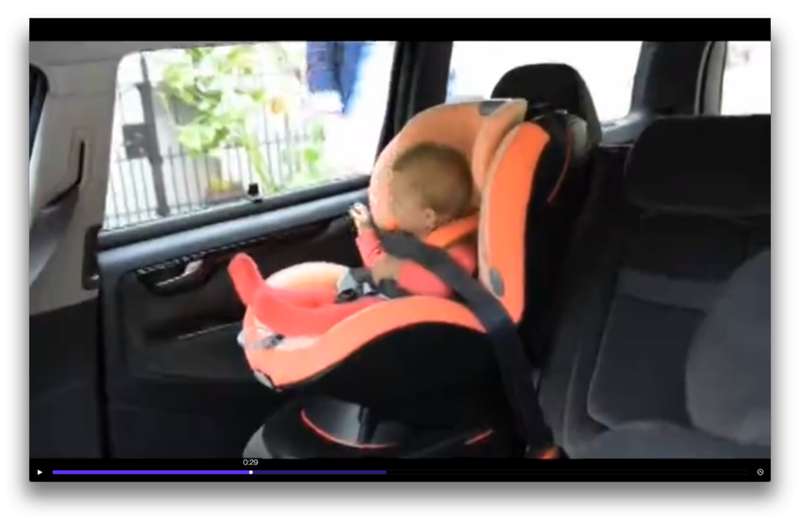 If the harness straps are above the child’s shoulders when rear facing, the child would continue to ride up the seat back and potentially expose their head above the car seat shell, leaving their head vulnerable to injury. This is particularly important in infant car seats (Group 0/0+)! Even with ISOFIX seats, you can get a bad install. Here only one of the ISOFIX connectors are properly plugged in. This can easily happen, so make sure to check that the connectors are green and good to go! Not all car seats fit in all cars. A common problem is ‘buckle crunch’. If your car seat has this, it’s not compatible with either your car or that position in the car. Some seats offer more than one belt path and some cars have different belt buckles depending on where in the car you are. Always make sure you watch out for this! The car seat has red for forward facing belt path, and blue for rear-facing belt path. This is universal on all car seats! Make sure you read your car seat manual fully and properly while installing your car seat! Let me know in a comment below what type of errors you have come across! ← Loving the Britax Head-support!